the piece that saves your time! No any registration is required. 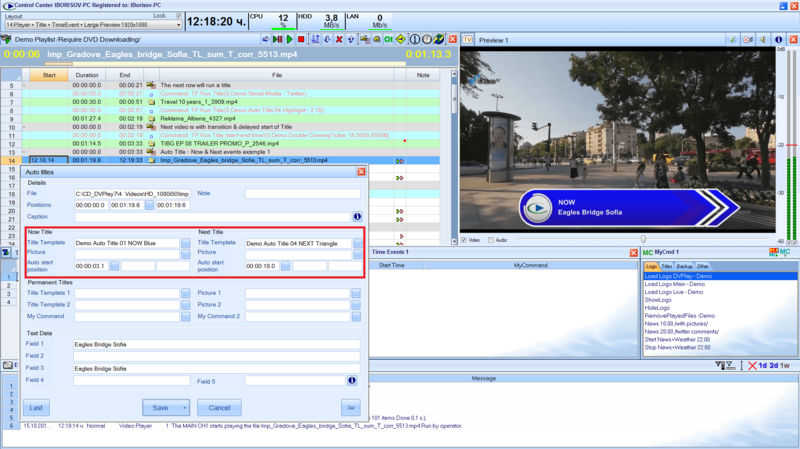 The video playout sofware / tv automation supports video files in format avi, mp2, mp4, mov, mxf, dvcpro, prores and many others at any resolutions and any frame rates, supports Live/IP/NDI Inputs, and creates video signal in SDI/HDMI/Analog/UDP/RTMP/NDI. The Character Generator /CG/ provides perfect TV quality, supports crawl and roll tickers, RSS, sequence animations, Picture in Picture, auto weather forecast, etc. The graphic is mixed with the live signal using the hardware of the playout server and that ensures a cost saving solution. The video playout is powered by extra modules that provide various useful functions like send commands to the video matrix via COM/IP, HD and SD outputs with different logos, Media Asset Management, TV Logger, Redundancy, Musical, News Editor, etc. The DV Logger could be used to capture the SDI/HDMI/Analog/IP TV signal to video files for the inject process, to transfer the TV signal from the remote TV Studio to the playout using the public Internet, etc.  A traffic solution which primary goal is to increase significantly the efficiency of the TV channel management in both major activities – sales commercials and playlists creation. The support is a major requirement in the TV business and we offer several different support options. 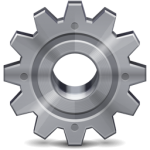 Our support is very experienced and includes support specialists + programmers ready to answer your questions via email or TeamViewer. 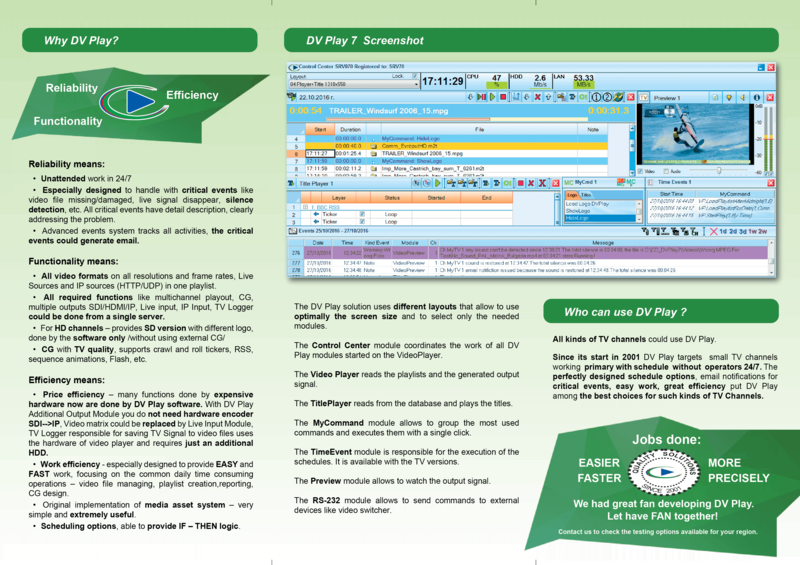 DV Play 7 is a modern playout / tv automation solution designed to be used in TV Channels. It was developed since 2001 based on customer’s requirements & feedback and we are proud to present to you our complete and tested playout software. • True 24/7 reliability – the playout is especially designed to avoid crash and to issue email warning when critical events arise. • Silence detection & email notifications proved as very useful. 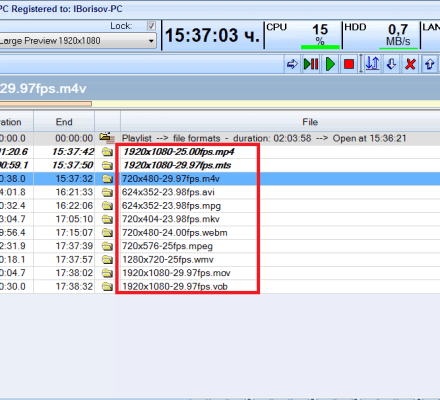 mkv, vp8, vp9, vob in different resolutions & frame rates in one playlist. • HD & SD simultaneous outputs with different logos – the playout supports multiple outputs formats (SDI/ HDMI/ IP/ NDI) on multiple resolutions (4K / HD / SD) that could be with different logos. • Live / IP / NDI input – supports DeckLinks, Aja, Deltacast & IP inputs /UDP, HTTP, RTMP/ & NDI. The IP streams are played like an ordinary video and support auto IP reconnect feature. • Multichannel – all needed functionality for up to 4 channels could be fit in one 2U/4U case. 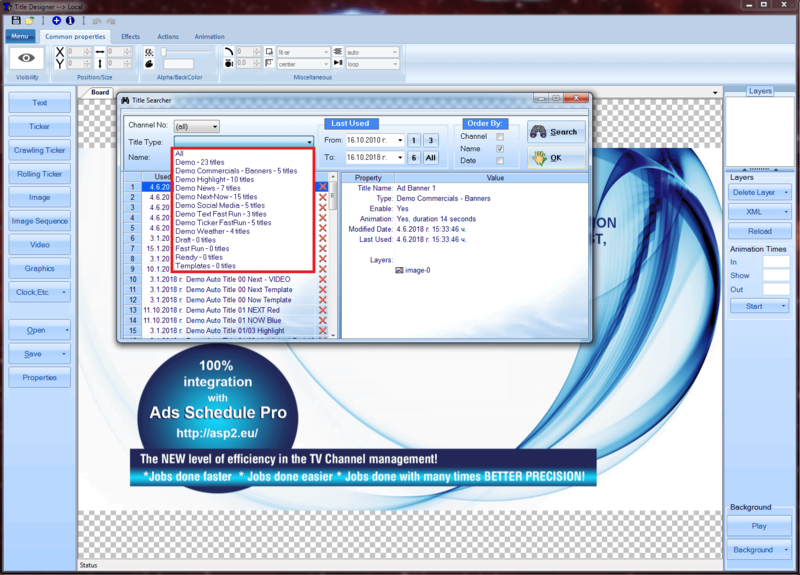 • Scheduling options – the powerful schedule options allow running the TV Channel without a human operator. 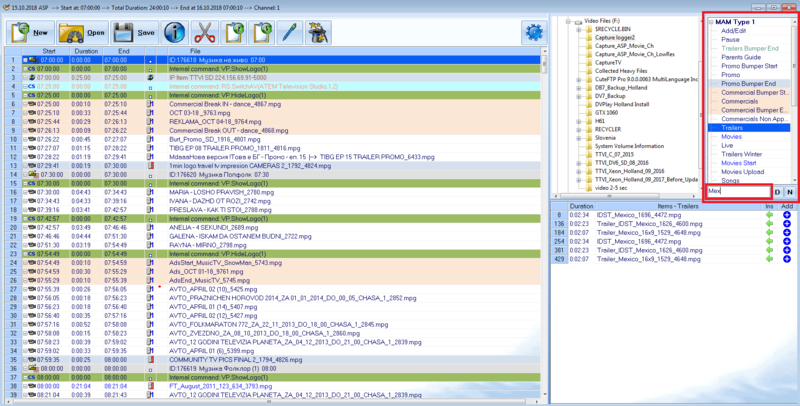 • Media Asset Management – Simple yet extremely useful powerful media asset management. 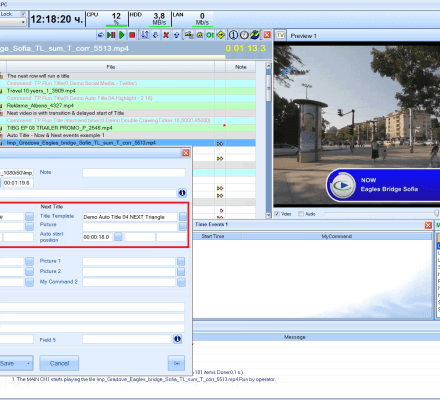 • Monitoring system – The TV Logger module captures the broadcasted TV signal and saves it to video files, using the hardware of the playout server and requiring just an extra HDD. • Redundancy 1:1 and N:M are supported. Download the Demo Version Now! 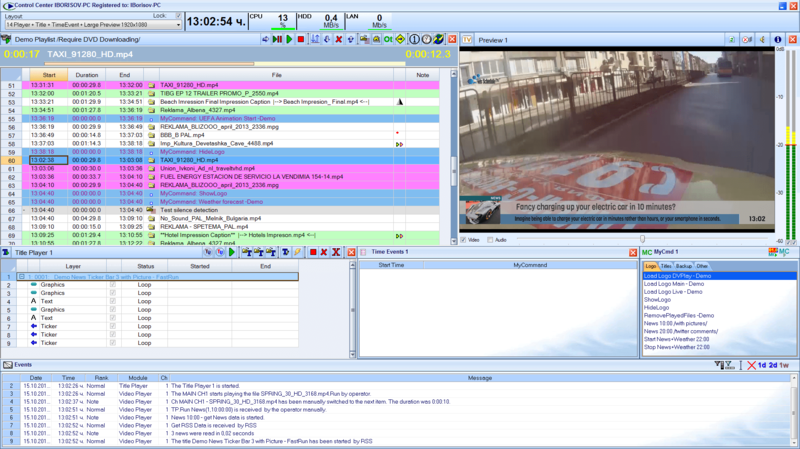 DV Play 7 Playout and DV Title (Graphic) Different layouts provided allow to select only the needed modules and to use optimally the available screen size - from 1024x768 up to 3840 x2160 pixels. Different layouts provided allow to select only the needed modules and to use optimally the available screen size - from 1024x768 up to 3840 x2160 pixels. 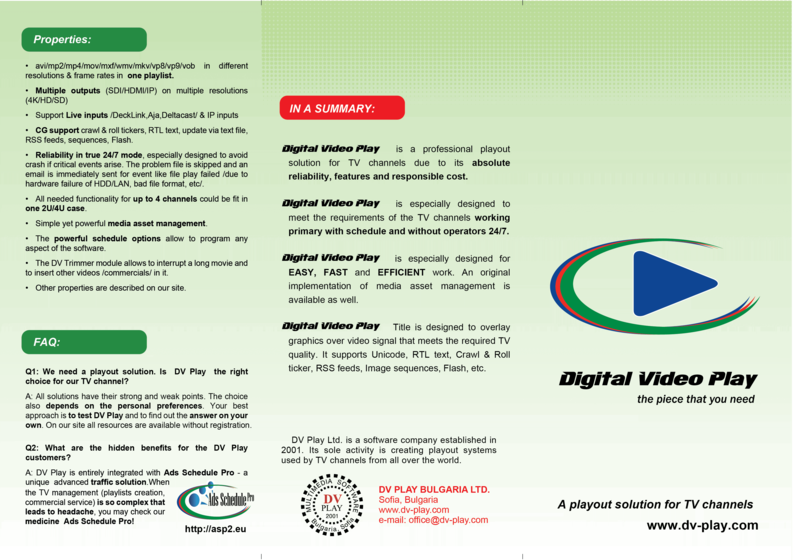 DV Play consists of 4 packages: Digital Video Play is the playout and the graphic software working on the playout server. 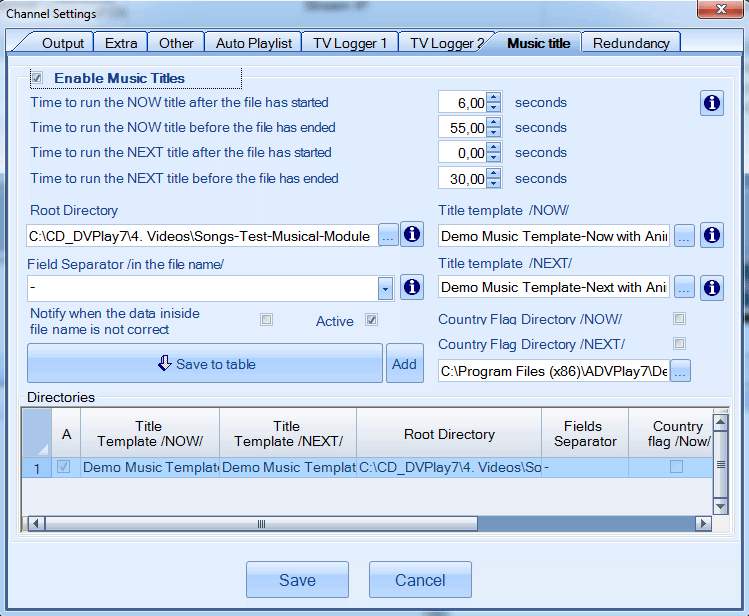 Playlist Editor creates playlists and could work both on the playout server and on workstations. 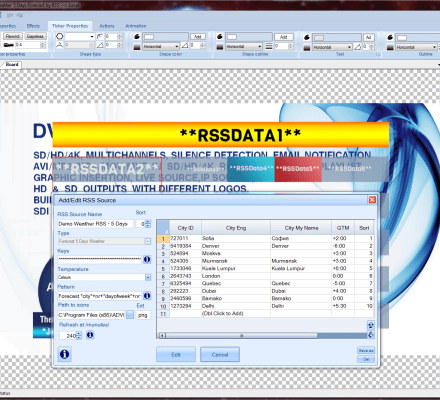 Title Designer is used to design graphics and could work both on the playout server and on workstations. 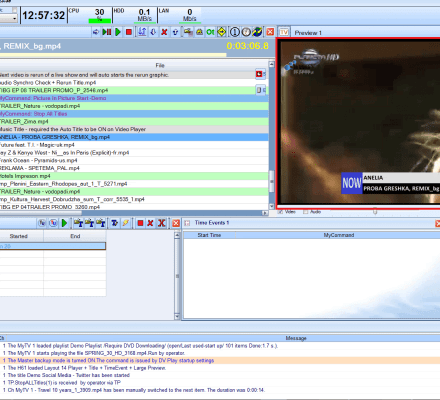 News Editor is used to organize news and could work both on the playout server and on workstations. 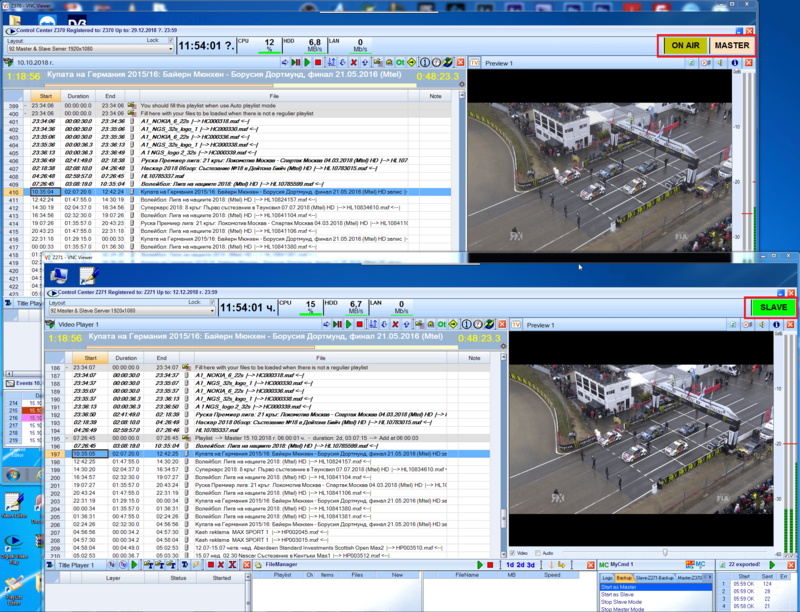 Digital Video Play is the playout and the graphic software working on the playout server. Silence detection & email notifications The Silence detection is proved as very useful if a video by error has not sound or the operator forgets to make playlist or makes it too short and nothing is broadcasted. Those events could be set to issue email notifications. The Silence detection is proved as very useful if a video by error has not sound or the operator forgets to make playlist or makes it too short and nothing is broadcasted. Those events could be set to issue email notifications. 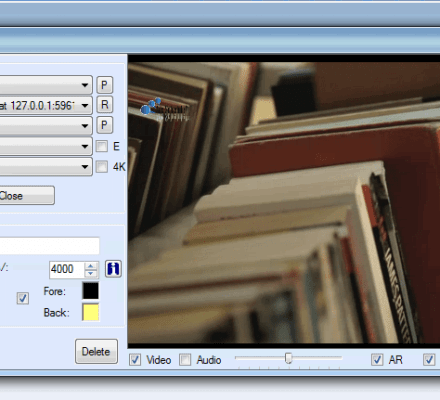 Multiple file formats 4K/HD/SD video files in any video formats are supported in one playlist. 4K/HD/SD video files in any video formats are supported in one playlist. 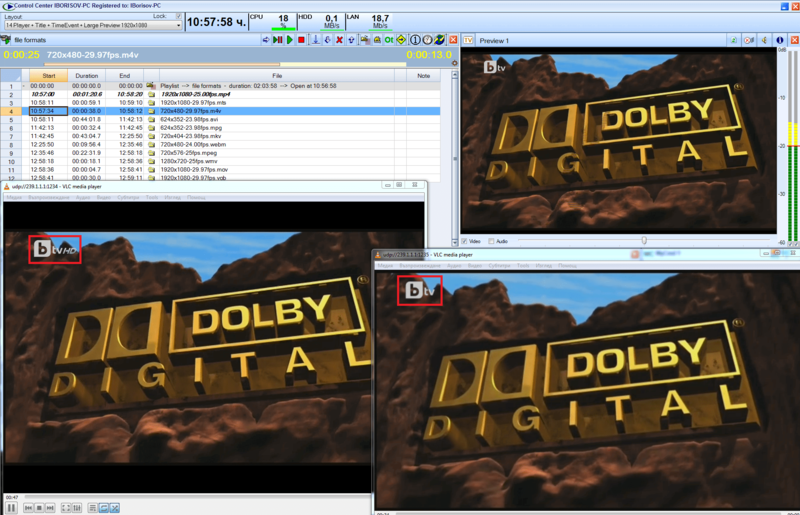 HD & SD outputs with different logos /station ID/ The screenshot show a DV Play set with HD & SD UDP outputs with different logos (look at the HD mark). 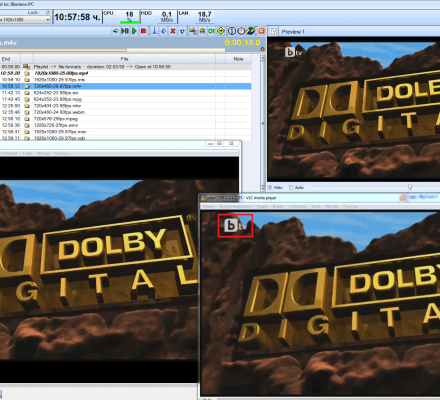 The screenshot show a DV Play set with HD & SD UDP outputs with different logos (look at the HD mark). Live Input The Live input could be SDI/HDMI/Analog with Blackmagic cards or NDI input. The Live input could be SDI/HDMI/Analog with Blackmagic cards or NDI input. Multichannels Up to 4 channels could use one single Intel- i7 server. 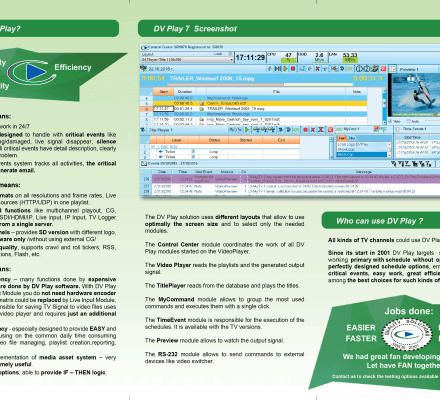 The screenshot is with DV Play 2 channels managed by Ads Schedule Pro – our traffic solution. Up to 4 channels could use one single Intel- i7 server. 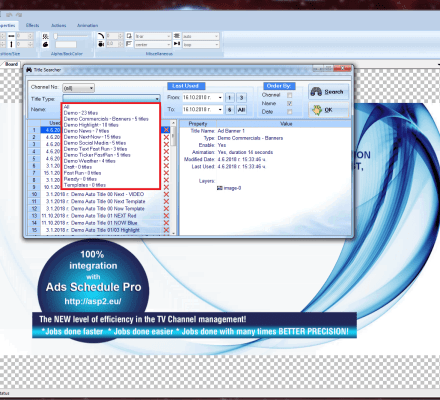 The screenshot is with DV Play 2 channels managed by Ads Schedule Pro – our traffic solution. Scheduling Once the schedule is set, the only action required is to create the playlist for specific date and start time. Any accidental restart of the player (loss of power supply for example) will auto load the playlist and will start playing it from the correct time. Once the schedule is set, the only action required is to create the playlist for specific date and start time. Any accidental restart of the player (loss of power supply for example) will auto load the playlist and will start playing it from the correct time. 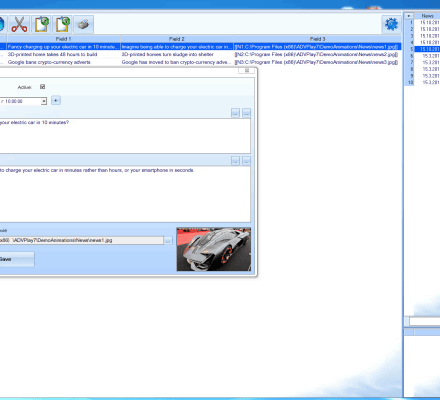 Media Asset Management It is very simple, but really powerful and extremely useful. It provides 2 major benefits: 1)Fast search with just typing of several letters 2)Colors in the playlists - different MAM keys like Commercials, Promos, Trailers, etc. are paint in a selected color. It is very simple, but really powerful and extremely useful. It provides 2 major benefits: 1)Fast search with just typing of several letters 2)Colors in the playlists - different MAM keys like Commercials, Promos, Trailers, etc. are paint in a selected color. 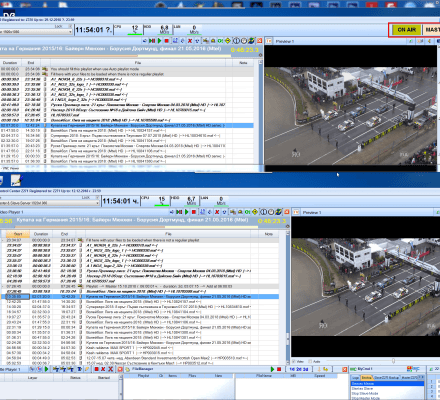 Redundancy The screenshot shows 2 playout servers with DV Play automation set in 1:1 redundancy mode (Master – Slave). 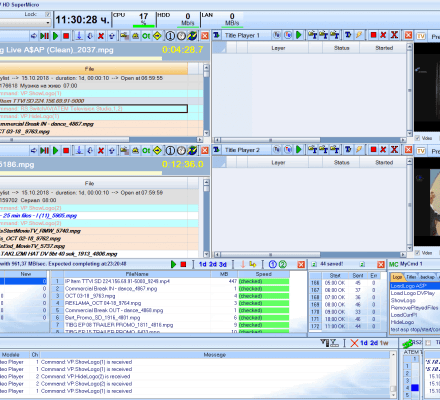 The screenshot shows 2 playout servers with DV Play automation set in 1:1 redundancy mode (Master – Slave). 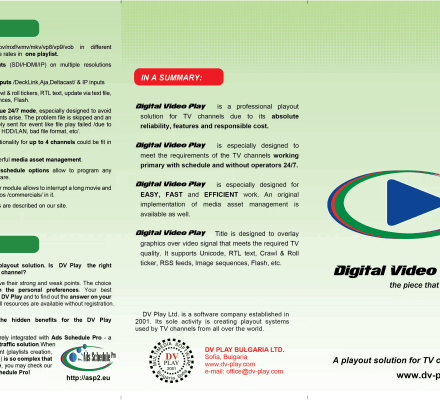 Summary of the video playout features. DV Play 7 Titles is a modern Character Generator which provides brilliant TV quality.  It was totally redesigned in the end of 2017 and allows to create very easy amazing looking titles. 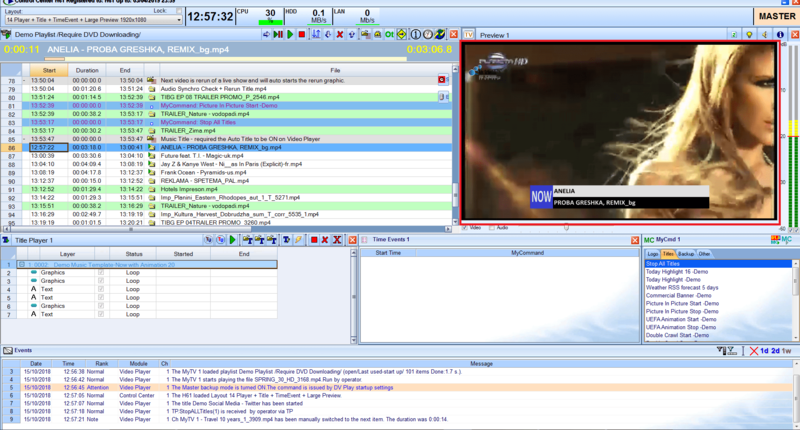 The CG solution is integrated in the playout and uses its hardware which provides a cost saving solution. Demo Graphic 80 examples of titles with TV broadcast quality, ready for use in your TV are included in our DVPlay DVD Demo (3.4GB). Download our DV Play DVD and open the Demo playlist to see them. 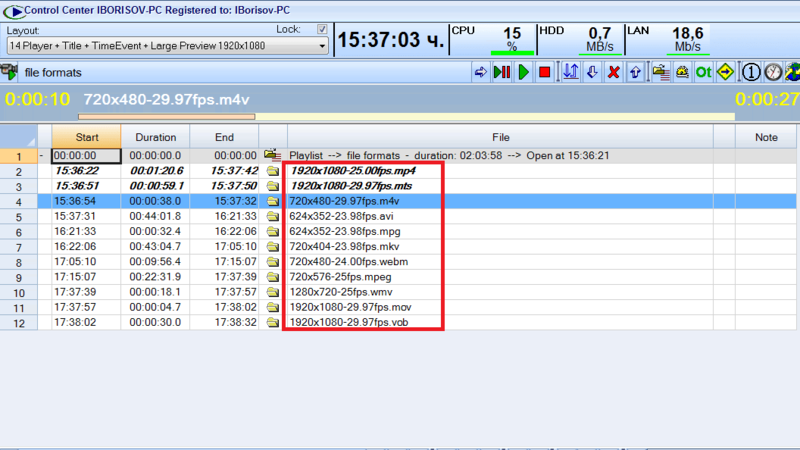 80 examples of titles with TV broadcast quality, ready for use in your TV are included in our DVPlay DVD Demo (3.4GB). Download our DV Play DVD and open the Demo playlist to see them. Now & Next Events The file has set the Now & Next event. 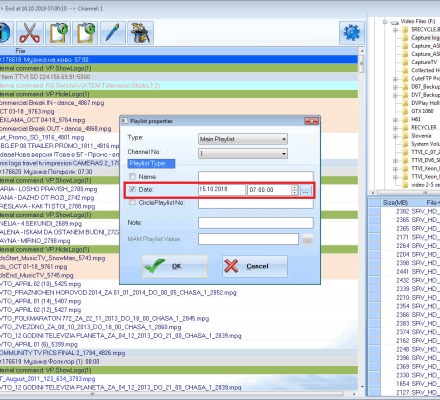 The Unique organization leads to huge time saving , once the Now & Next is set for a file, it is automatically used when you play the file next time. The file has set the Now & Next event. 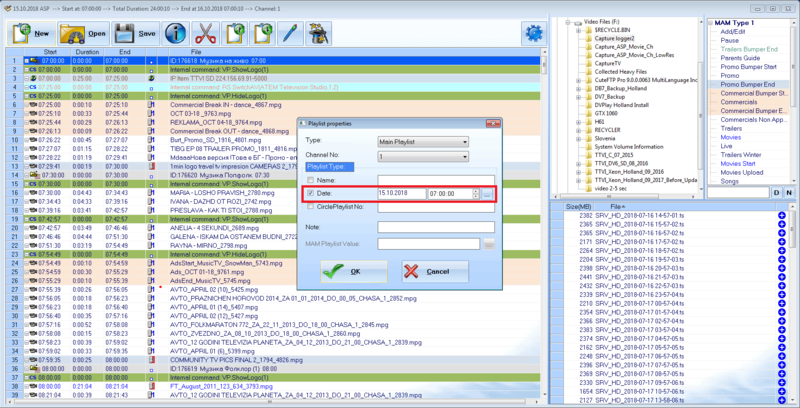 The Unique organization leads to huge time saving , once the Now & Next is set for a file, it is automatically used when you play the file next time. Weather forecast The screenshot shows our demo 5 days weather forecast example. Local languages and data for 210,000 cities from all countries are available for free! The screenshot shows our demo 5 days weather forecast example. Local languages and data for 210,000 cities from all countries are available for free! Commercials with graphic Several different options especially designed for commercials with graphic are available. Several different options especially designed for commercials with graphic are available. Permanent title The Permanent title is shown automatically every time you play the file, typically used to show a re-run mark of recorded live show, to show an age limitation mark(like shown on screenshot), etc. The Permanent title is shown automatically every time you play the file, typically used to show a re-run mark of recorded live show, to show an age limitation mark(like shown on screenshot), etc. Musical module The Musical module auto runs a title with extracting the data from the file name – typically the performer & the song name. The Musical module auto runs a title with extracting the data from the file name – typically the performer & the song name. Musical module 2 The Musical module auto runs a title with extracting the data from the file name – typically the performer & the song name. News With a single command the news set prepared for specific time (10:00 a.m. for example) could be run. With a single command the news set prepared for specific time (10:00 a.m. for example) could be run. News Editor The News is gathered and prepared for broadcasting with the News Editor. The News is gathered and prepared for broadcasting with the News Editor. 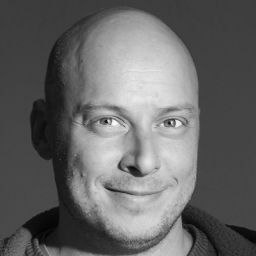 Crawl and roll tickers that could be updated via text file, TGA,PNG, sequences, video background with alpha channel .mov, etc. 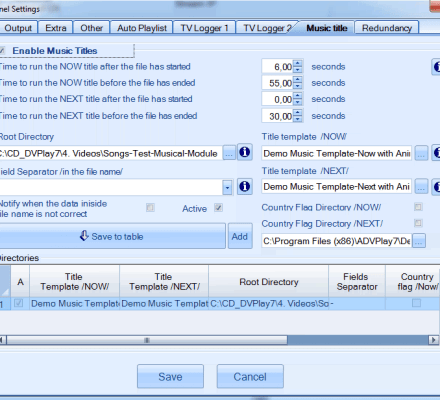 Many options to run manually a title or to schedule it into playlists. Commercials with graphic (bugs, bumpers, etc.) are supported. 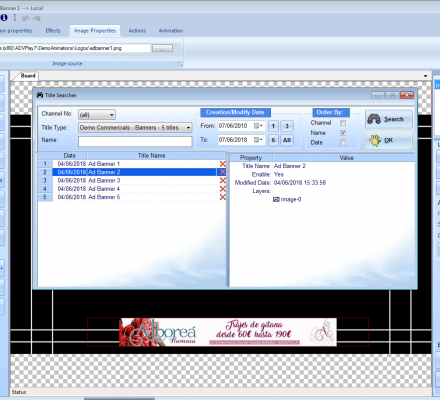 Permanent titles – allow to set a title that is auto run when a video is played. Typical use is to mark a re-run broadcast of recorded live show, etc. Now & Coming Next events using unique organization that saves a lot of time. 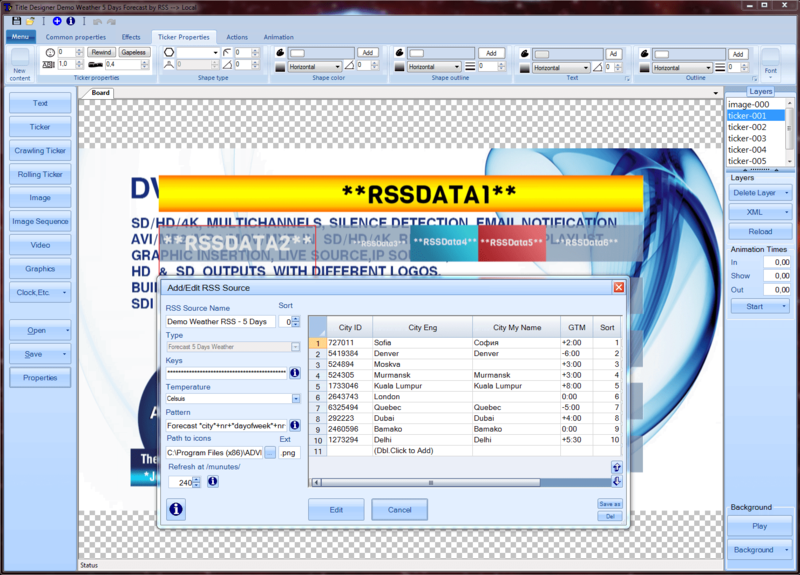 3 different types of graphic templates could be used – with text, with static picture or with the video itself. Musical module – auto runs a title showing the current & next songs. 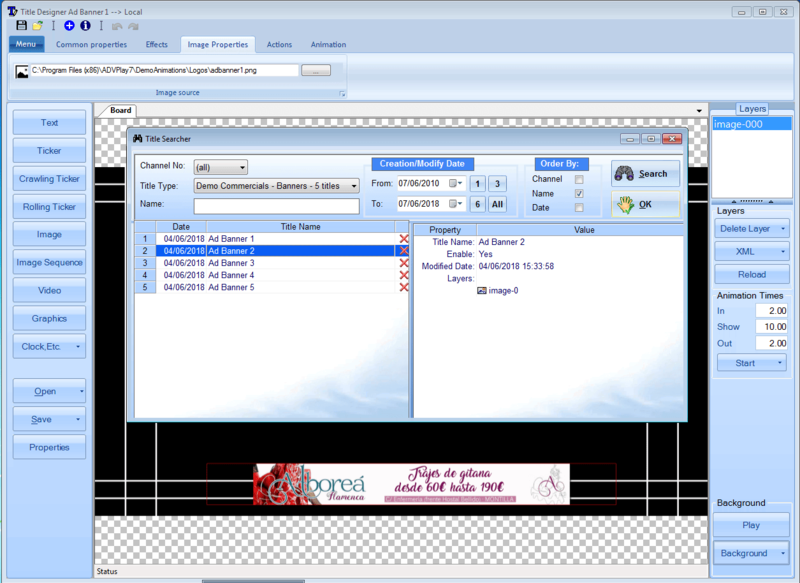 News Editor – allows gather, group news and show them as title.  Weather forecast – auto extraction of weather forecast data via Internet and display as title. More than 210 000 cities from worldwide countries are available. New in the TV Channel Business? A significant part of our customers are companies/persons who start their first TV channel and often they have not an experienced TV specialist. We recommend them to read our FAQ page, the section New in the TV Business? 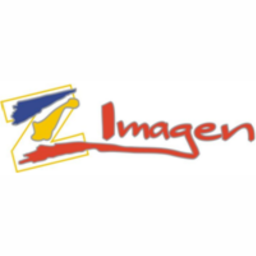 Technical Director, Montalbán de Córdoba, SPAIN, Zimagen S.L. Technical Director, Montilla, SPAIN, Esycor S.A.
We know for long time the company DV Play and ask them to provide a solution for a new Sport TV. The workflow in the Sport TV channel we manage is very complex and the list with requirements is big, but DV Play covers all of them. We are very happy with the level of support provided by DV Play and looking forward to use DV Play solutions for our new 4K channel coming soon. 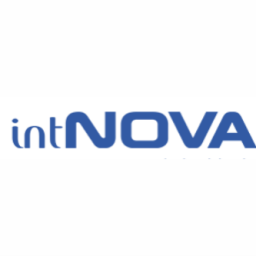 Our software company has been established in 2001 in Sofia, the capital city of Bulgaria. Our sole activity is to create video playout software for tv automation used by the TV channels from all over the world. In DV Play 7 we have invested all of our 17 years experience. 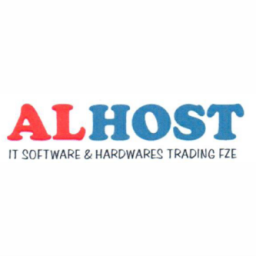 The software has undergone a long process of development, fixing and adding new features. 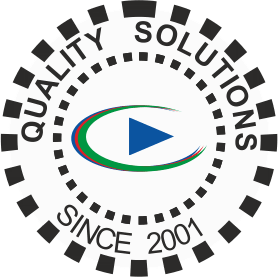 We are glad to present you complete and tested playout solutions. © Copyrights 2009-2018 All rights reserved.